Handmade Traditional Indian Miniature Painting. Miniatures are small, colorful pictures of Mysterious Art painted in glowing mineral and vegetable colors. Material -Paper Sheet. Hindu Goddess Ambey Durga. Miniatures are small, colorful pictures of Hindu Goddess Ambey /Durga. Mahishasura, upon hearing about her, sent his army to defeat and capture her. Durga kills all of the demons and challenges Mahishasura to a one-to-one fight. Hindu Paper Painting India. Miniatures are small, colorful pictures of Mysterious Art painted in glowing mineral and vegetable colors. Product - Handmade Traditional Indian Miniature Painting. Miniatures are small, colorful pictures of Hindu God dess Ambey /Durga. Hindu Go ddess Durga. Handmade Traditional Indian Miniature Painting. painted in glowing mineral and vegetable colors. Indian Art. 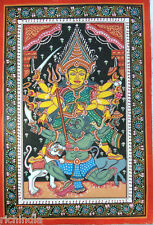 Tantrik Tantric YantraTantra Art Handmade Asian God Bhairav PaperPainting India. Product - Handmade Traditional Indian Miniature Painting. Miniatures are small, colorful pictures of Mysterious Art painted in glowing mineral and vegetable colors. Miniatures are small, colorful pictures of Hindu God Ganesha painted in glowing mineral and vegetable colors. Hindu God Ganesha (Elephant God of India). Handmade Traditional Indian Miniature Painting. The earliest Ardhanarishvara images are dated to the Kushan period, starting from the first century CE. Its iconography evolved and was perfected in the Gupta era. The Puranas and various iconographic treatises write about the mythology and iconography of Ardhanarishvara. Illuminated Islamic Script Art. Product - Handmade Traditional Persian Miniature Painting. Persian Ottoman Turkish Style HANDMADE Painting. Pattern - Persian Art/ Turkish Art. Although he is known by many attributes, Ganesha's elephant head makes him easy to identify. As the god of beginnings, he is honoured at the start of rituals and ceremonies. Ganesha is also invoked as patron of letters and learning during writing sessions.Several texts relate mythological anecdotes associated with his birth and exploits and explain his distinct iconography. Miniatures are small, colorful pictures of Hindu God Krishna painted in glowing mineral and vegetable colors. Hindu God Krishna. Handmade Traditional Indian Miniature Painting. 100% Handmade. Hindu Goddess Kali Kalika. Hindu Goddess Kalika. Miniatures are small, colorful pictures of Hindu Goddess Kali painted in glowing mineral and vegetable colors. Handmade miniature Painting India. Hindu God Ganesha. Miniatures are small, colorful pictures of Hindu God Ganesha painted in glowing mineral and vegetable colors. Hindu God Ganesha (Elephant God of India) . Handmade miniature Painting India. Hindu God Ganesha. Miniatures are small, colorful pictures of Hindu God Ganesha painted in glowing mineral and vegetable colors. Handmade miniature Painting India. Product - Handmade Traditional Indian Miniature Painting. Hindu God Ganesha. Miniatures are small, colorful pictures of Hindu God Ganesha painted in glowing mineral and vegetable colors. Product - Handmade Traditional Indian Miniature Painting. Miniatures are small, colorful pictures of Hindu God Shiva Shankar painted in glowing mineral and vegetable colors. Hindu God Shiva Shankar. Handmade Traditional Indian Miniature Painting. This is highly talented and skilled artists produce the ostentatious paintings on cloth. Miniatures are small, colorful pictures of Hindu Goddess Laxmi painted in glowing mineral and vegetable colors. Hindu God Laxmi. Handmade Traditional Indian Miniature Painting. Indian Art. Otherwisedeal is final. Hindu Goddess Devi Kali. Miniatures are small, colorful pictures of Hindu Goddess Kali painted in glowing mineral and vegetable colors. Kālī is represented as the consort of Lord Shiva, on whose body she is often seen standing. Miniatures are small, colorful pictures of Hindu Goddess Laxmi painted in glowing mineral and vegetable colors. Hindu God Laxmi. Handmade Traditional Indian Miniature Painting. This is highly talented and skilled artists produce the ostentatious paintings on cloth. Product - Handmade Traditional Indian Miniature Painting. Miniatures are small, colorful pictures of Forest Live painted in glowing mineral and vegetable colors. Forest Live. Paper Painting Artist color INDIA. Miniatures are small, colorful pictures of Hindu God Krishna painted in glowing mineral and vegetable colors. Product - Handmade Traditional Indian Miniature Painting. Pattern - Indian Art. Miniatures are small, colorful pictures of Hindu Goddess Laxmi painted in glowing mineral and vegetable colors. About Laxmi. She is wife of God Vishnu. 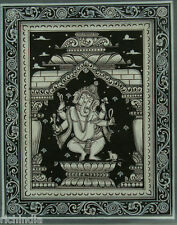 Product - Handmade Traditional Indian Miniature Painting.